Rescue operations are under way as more than 120 people are still stranded on the deck of a blazing Norman Atlantic ferry amid freezing temperatures off the Greek island of Corfu. Helicopter crews have been winching small groups of people to safety despite gale-force winds. 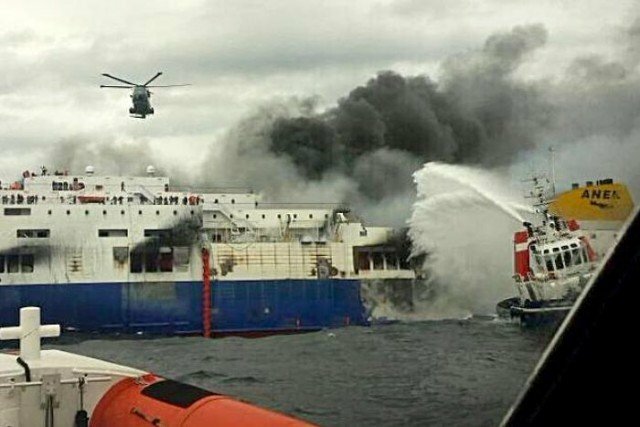 The Italian coast guard said 356 of the 478 people on board had been evacuated by early Monday, December 29, after a fire broke out on a car deck on Sunday, December 28. One person is confirmed dead but a passenger has said he saw more bodies. The Italian navy said that the body of a Greek man and his injured wife had been removed from the ship, Norman Atlantic which had been travelling from Patras in Greece to Ancona in Italy. It is unclear how the man died but the Greek coastguard told AP that both passengers had been found trapped in a lifeboat escape chute. The first rescue ship carrying 49 people arrived at the Italian port of Bari early on Monday morning. A Turkish man who was on board told local reporters that he was sure that he had seen more bodies. “I saw four people dead, with my own eyes,” he said. Helicopters crews fitted with night vision equipment worked through the night to rescue passengers despite difficult conditions. One hundred people were taken off the ferry during the night, the Italian coast guard said. Italian Air Force helicopter pilot, Major Antonio Laneve told Italian state TV that “acrid smoke” had filled his helicopter cabin, making the rescue even more challenging. Most of the rescued passengers have been transferred to nearby ships, although some have been taken directly to hospital. Passengers described panicking as the heat rose, then freezing as they stood on decks awaiting rescue. Coast Guard Admiral Giovanni Pettorino said that a member of the Italian military had been injured during the rescue. Nearby merchant vessels aligned themselves in formation to protect the ship from waves and facilitate the rescue. “This is a complicated rescue mission. The visibility is poor and the weather conditions are difficult, but we are confident because there are a good number of ships in the area,” Greece Merchant Marine Minister Miltiadis Varvitsiotis said. Miltiadis Varvitsiotis later told reporters the fire had been brought partly under control. Most of those on board were Greek. Greek maritime official Nikos Lagadianos told AP that 234 passengers and 34 crew members were from Greece. Others came from Italy, Turkey, Albania, Germany and several other countries. The chief executive of the Visentini group that owns the vessel, Carlo Visentini, said the ferry had passed a recent technical inspection despite a “slight malfunction” in one of the fire doors, Italy’s Ansa news agency reports.